He was born in 1954 in Pilsen. He is interested in the graphical work, mainly in the combination of the etching and aquatint, and of course the ex-libris, which he has created around seventy, mainly as exclusive orders for well-known European collectors. He combines the characters and faces with the rich decorative items of vegetation and even the human artefacts. 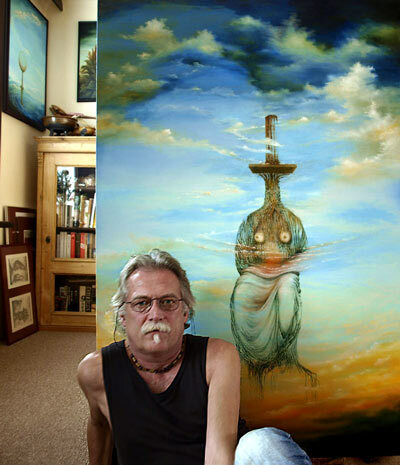 He also creates paintings and pictures, which dark symbolism which reaches over the surrealism and he is inspired by the dreams and imagination. Jiří Vlach illustrated a book of psychological stories named “ Expecting (Awaiting) of Kateřina, published in 2001, written by Doc.MuDr. Zdenka Ulčová – Gallová, Dr. Sc. Jiří Vlach has fans in the homeland , but also worldwide.